We want to personally invite you and your team to our campus for our Juniata College Football Camps. Each camp will prove to be rewarding and beneficial. The camps provide the opportunity to improve your football skills while developing a better understanding of all phases of the game. Our staff is excited about working with you this summer. 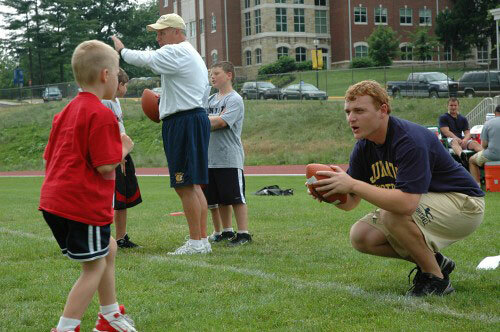 All sessions will be held at Juniata College's Football facilities and conducted by the Juniata Football staff. All camps will feature an emphasis on techniques and the fundamentals of football. There will be individual time spent with each player as well as instruction based on level of play. A major part of each camp is to also encourage teamwork and sportsmanship. Registration fee increase to $70 for walk-ups. This camp will focus on high school players and introduce them to a college football setting. It is a non-contact camp to develop each player’s specific skills and provide competition with an exciting atmosphere. The camp will also focus on what to expect from the college recruiting experience, academic and compliance workshops and a chance to experience what it is like to be a college football player at Juniata. Instruction will be position specific and place an emphasis on individual skill development. Lunch is also provided. (Prices, dates, and other information located below). This camp will focus on offensive and defensive lineman and will be held in conjunction with the 7-on-7 passing tournament. It is a perfect opportunity for coaches to bring their whole team for a day of instruction and competition. The camp will feature personalized instruction, an emphasis on specific techniques, and the basic skills of line play. These sessions are designed to enhance and develop stance and starts, footwork, change of direction, hand placements, and proper pad level. T-shirts will be provided for the champions. Lunch is also provided. (Prices, dates, and other information located below). The camps will utilize one of the many playing fields on campus. The intramural gym and mezzanine areas as well as the Memorial Gym will be available in case of inclement weather. Additional facilities available include an indoor swimming pool and a fitness center. For more information about the Juniata Football team and coaches, please visit the Juniata Athletics webpage! Payment, including a $50 non-refundable fee, is due in full at the time of registration. No refunds issued for cancellations made within 2 weeks of the camp.